The landscape of higher education is under change. Geographical boundaries are tumbling down and the digital economy is opening up new opportunities. Tradition is sometimes challenged by modern technology and shifts in perspectives between generations. One of the areas of change is collaboration and teamwork between students, researchers, faculties and external stakeholders. How to enable seamless collaboration, intuitive information sharing and planning in an intense, learning environment? For a growing number of institutions, cloud-based collaboration and project management tools have become essential. 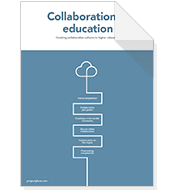 In this whitepaper, we will explore how three different universities, The University of Wales Trinity Saint David, The University of Applied Sciences and Arts, Nordwestschweiz, and Campus Åre have approached online collaboration and what experiences they have learned. All three examples are available as case studies for a further deep dive.